Anthology Film Archive's Jonas Mekas Talks Preserving Avant Garde Film and His "Cathedral of Cinema"
Jonas Mekas owns the title of Godfather of avant-garde Cinema. At 94 years of age, he's earned it--but he's not ready to call it a day. He continues to make movies (albeit digital) and to work on his "Cathedral of Film" aka The Anthology Film Archives, the world's foremost repository of experimental films, books and related materials, including what may be the largest collection of film magazines from the 40s, 50s and 60s. He's especially proud to own the shooting script of Orson Welles' Citizen Kane, complete with the great director's annotations and edits. There's lots more, much of it inaccessible, stored away or still in boxes waiting for the day it can be unpacked and made available to the public. Which is why we're meeting. On March 2, the Anthology is hosting a Gala Art Auction to raise money to add a library and café to its formidable brick building in the East Village. I first encountered Mekas' work as the writer of the Movie Journal column in the old Village Voice. An advocate for what became known as the New American Cinema, he focused on non-commercial foreign films – think Godard, Antonioni et. al. – and poetic filmmakers such as Stan Brakhage, Kenneth Anger and Maya Deren. It would take a book (or several) to discuss the many facets of Mekas' personal sacrifice and unselfish dedication to his art, but they are all somehow contained in his "cathedral" – the filmmaker, the poet, the writer, the organizer, the advocate. Basically an unstoppable force who has devoted his life to preserving and advocating for the most impoverished, neglected and overlooked aspect of a multi-billion dollar industry. Spry and lucid at his advanced age, he grabs a corner table in the empty café and orders a Baltica beer at our 12:30 meeting. "My job," he says, his Lithuanian accent still rich after all these years in America, "is to persuade all my artist friends to contribute work to the auction and they have been supporting enthusiastically. My next big job is to find the buyers. We have Richard Serra, we have Chuck Close, we have Cindy Sherman, we have big names but we also need collectors. Once you live as long as I do you know a lot of people. Now I have about 100 artists with works for sale going from a few thousand dollars to $200,000." 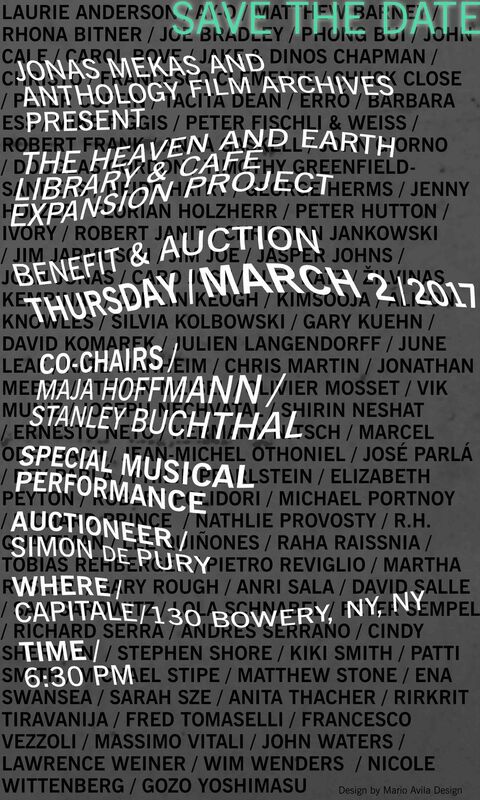 The benefit committee includes such icons and stalwarts as Laurie Anderson, Matthew Barney, Peter Bogdanovich, Robert Frank, Richard Foreman, Philip Glass and Patti Smith. Jonas and his brother Adolfas fled their home during World War II, were imprisoned in a labor camp and escaped, studied philosophy, emigrated to New York in 1949, established the magazine Film Culture and proceeded to become powerful figures in New York's avant-garde community. "When I stepped on the island of Manhattan," says Jonas, "that's where my life really began in cinema and life in general. When I was a kid I did not see any films. I think I was 15 when a teacher took us to the city. It was some American melodrama which I don't remember at all. With a Disney cartoon. Mickey Mouse. The first film that I saw that impressed me was John Huston's The Treasure of Sierra Madre. For the first time I thought that something can be done with cinema. That was the beginning." What sealed his interest was a film festival of New French Cinema that took place in Germany where he saw Cocteau's Beauty and the Beast. "I still have the program," he says. A natural born collector and preserver, his pursuit of a showcase for the avant-garde had several iterations before landing at the Anthology's current home in 1979. A filmmaker himself, with hundreds of short films to his credit, many of them "diaries" of his walks around the city, he still posts at least two episodes a week on his web site. His busy schedule includes upcoming retrospectives at Harvard and museums in Portugal and Spain. "And this year," he adds, "I'm part of Documenta, which takes place in Athens, Greece and Kassel, Germany. The focus is on refugees and my show will be 40-50 photos that I took in 1947-48 when I was in a displaced persons camp in Germany." Over the years, the Anthology has screened thousands of films, both commercial and experimental and grown its collection to some 20,000 movies and still, Mekas feels, he gets no respect from the Hollywood community. "I'm amazed that the film industry has not responded to any of my requests," he says, his voice rising with indignation. Citing exceptions like Martin Scorsese and Peter Bogdanovich, he shakes his head at Harvey Weinstein, who, he thinks, should know better because of his roots. "He doesn't even answer my letters. They [Hollywood] are so much in themselves. They care just about their own success, about fame. Somehow they are not interested and they don't go out to help their own art so to speak. Let them understand that we are also part of what is known as cinema – a branch on the same tree and that we are all together. I want the Anthology Film Archives to be one of the reminders that there is poetry in life, poetry in cinema. That cinema is not all entertainment, a money making project. And when you see this building and when you see the library you will ask, 'What is this?' And then you will say, 'That's the Cathedral of Cinema.'"